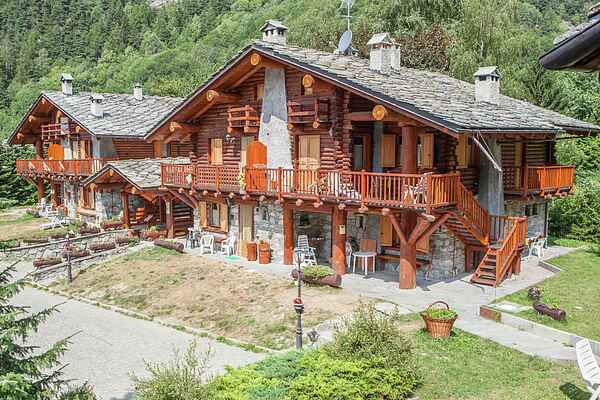 The chalet-village is situated in a quiet and sunny area of Antey Saint André, distant few kilometres from the famous ski area of Breuil-Cervinia, where you can ski also in summer in the glacier of Plateau Rosa, above Cervinia, from 3500 up to 4050 meters. It's an ideal starting point to explore the whole area. You can take a walk in the natural area, or take a mountain bike, or do an excursion in the Alps. Nearby the village there is an adventures park, open-air swimming pool, riding school, tennis and football fields, climbing-wall. At your arrival you will receive a welcome basket with typical products of the area: cheese, bread, raspberry-jam, apple-juice. Extra beds are provided free of charge (up to 1) for kids under the age of 15 years. Upon request ski instructor David Merlo is available to accompany guests, maximum 8 people, on the ski slopes for day trips, both on track and off track with the use of a helicopter. David Merlo has its own shuttle bus with 9 seats. In the summer David Merlo is available, upon request, to accompany guests with mountain bikes (mountain bikes are provided). Upon request, a chef can come and cook typical dishes from our region in your apartment.